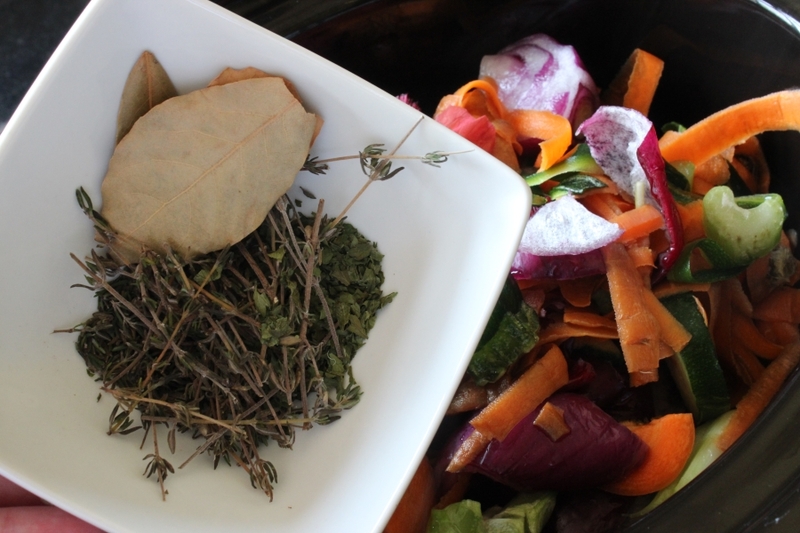 This slow cooker vegetable stock recipe has been one I’ve been meaning to share for a while. 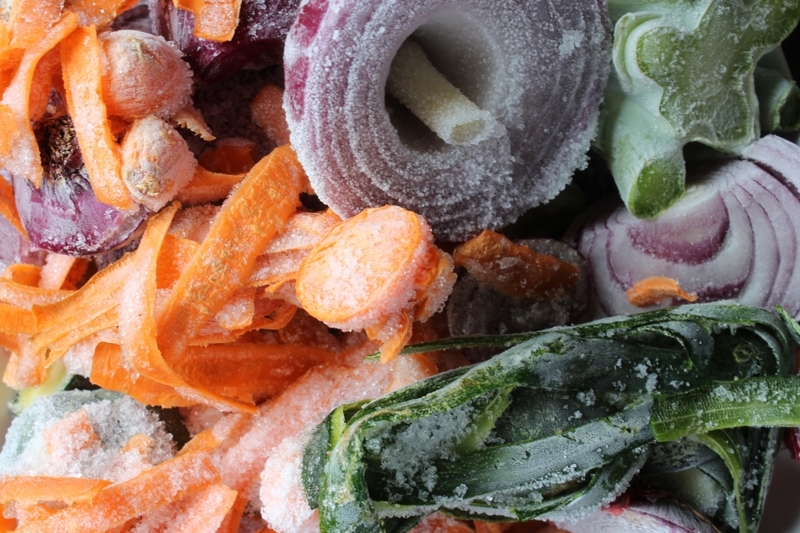 What better day than Food Waste Friday to do just that – particularly as I had 2 bags of vegetable scraps to use up. 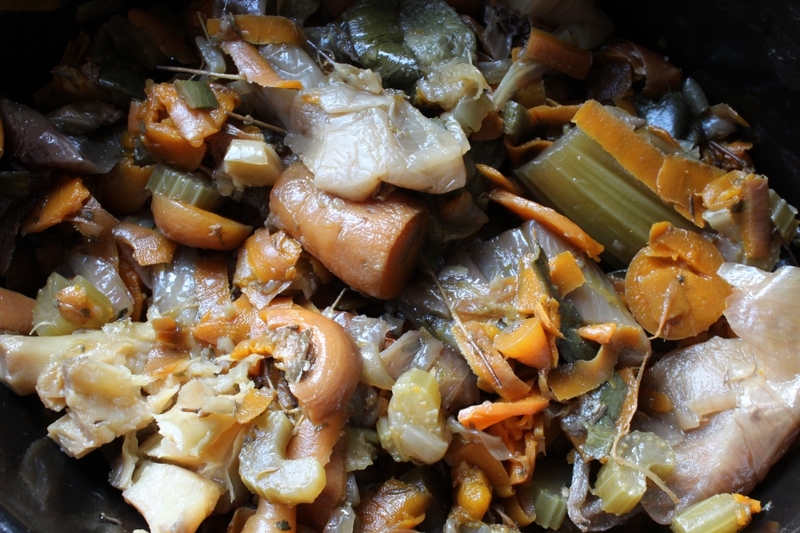 This vegetable stock can of course be made with fresh vegetables, but it’s perfect for extending the life of those waifs and strays of the vegetable world – scraps. The tops and tails of things that you’d rather not include in the dish you are rustling up. They may not look pretty but still have nutritional value. They get thoroughly washed then re-homed in a bag and take up residence in the freezer until I have time (and inclination) for my slow cooker vegetable stock recipe. 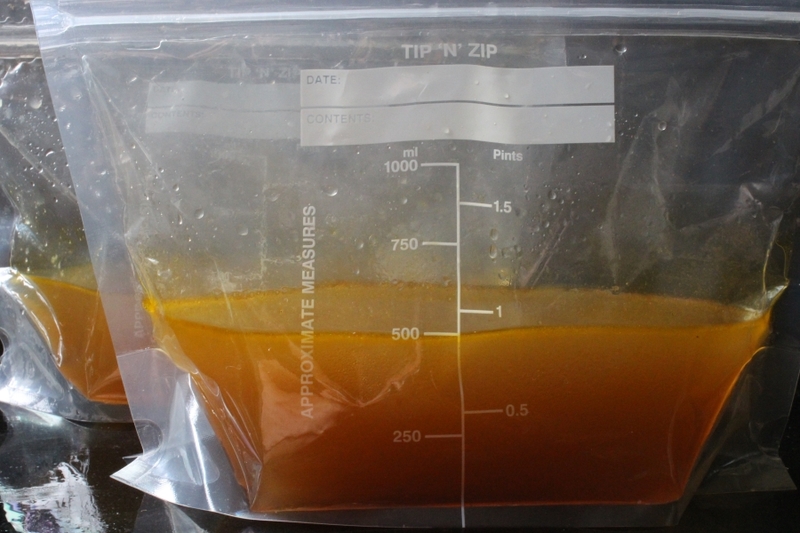 I store my scraps in reusable bags suitable for soups and liquids as they have a flat base – once the stock is ready I will refill the bags with the stock and freeze once more until needed. To make a good stock you do need some fresh vegetables also. Roughly chop 2 onions, 3 celery sticks and 3 medium carrots. Heat a little vegetable oil in a pan with 3-5 cloves of crushed garlic, depending on taste. 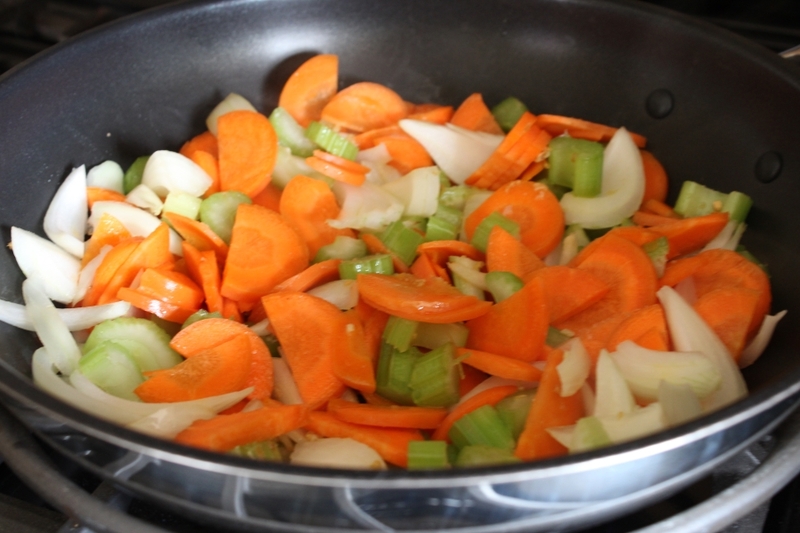 Add the onion, celery and carrots and sweat the vegetables for approx. 15 minutes. 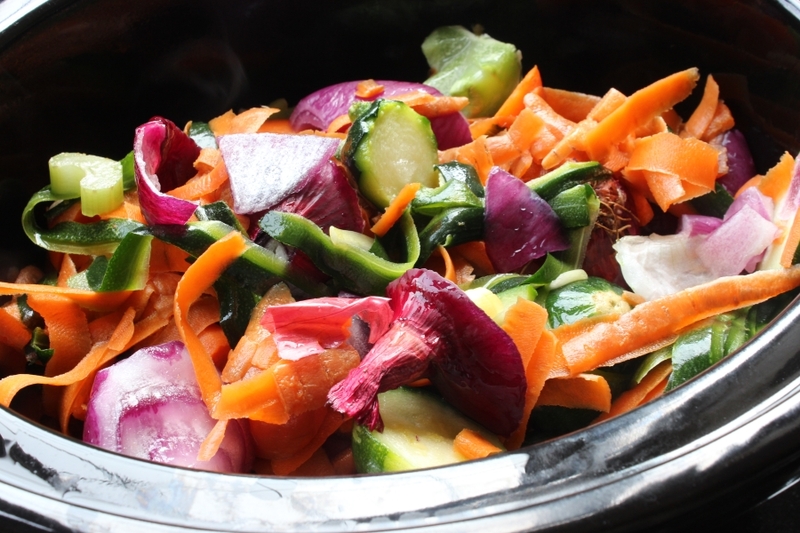 Then place them in a standard slow cooker (3.5l) adding the thawed vegetable scraps. Add some herbs and a couple of bay leaves (I added fresh thyme but dried parsley as that’s what I had to hand). 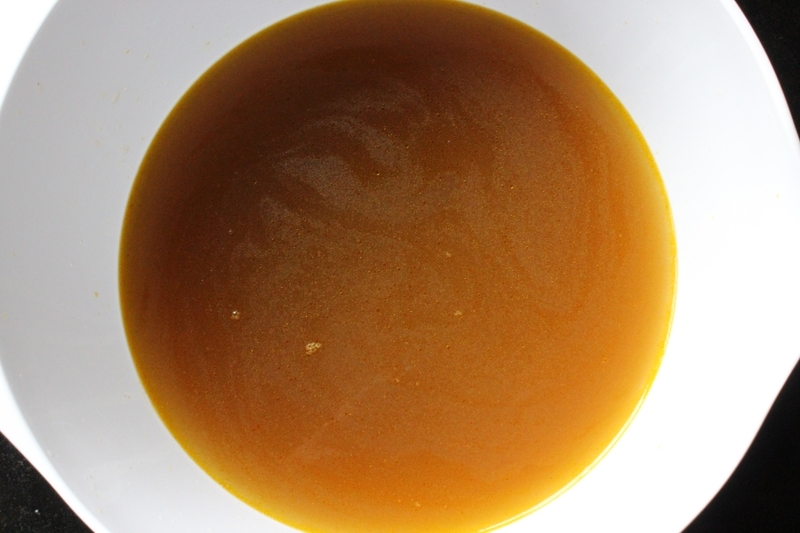 I do not add salt to the stock – this can be added when the stock is used in the dish you are making (if it’s required) – when my two offspring were babies I always made fresh stock as a base for their pureed meals. It adds flavour without adding salt. Top up the slow cooker with boiling water until there is an inch left from the top. 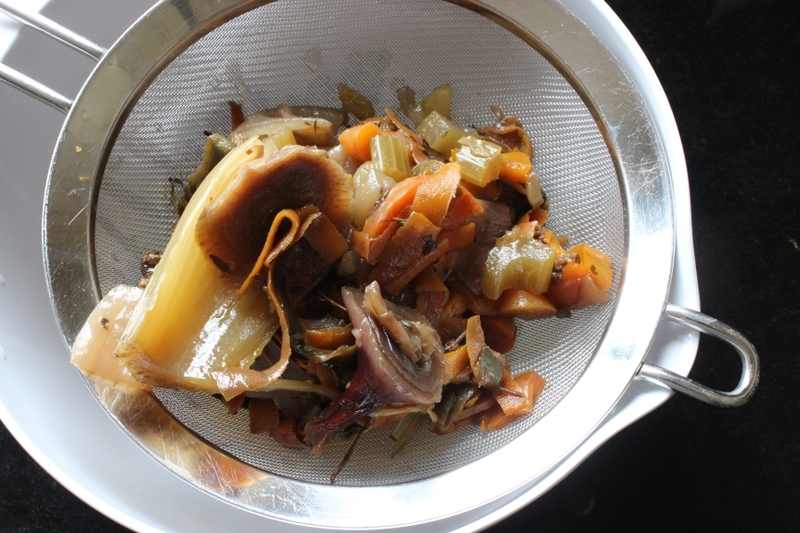 This slow cooker vegetable stock recipe needs a minimum of 4 hours on high or 8 hours on low, but can be left longer. I cooked my vegetable stock for 4 hours on high and then turned to low for another 6 hours. I also left the stock to cool overnight before straining. When cooked and cooled strain all of the contents through a sieve. 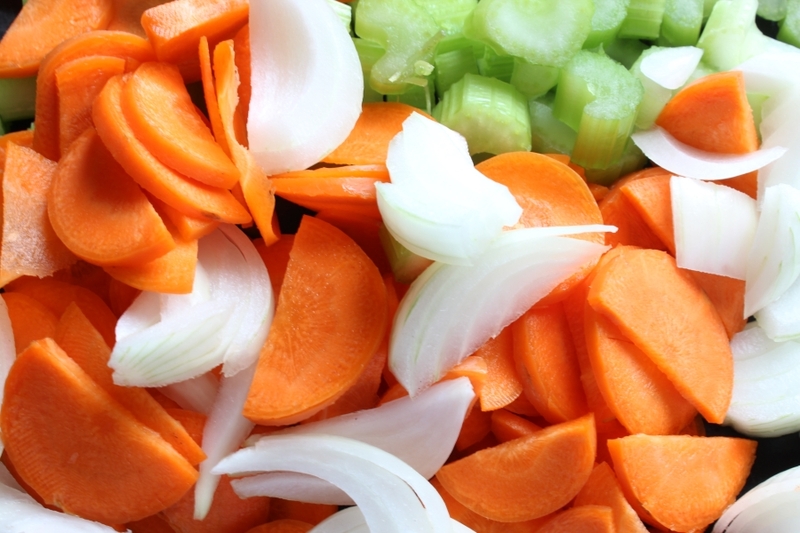 This slow cooker vegetable stock recipe will make approx. 1ltr (just under 2 pints) of stock. As I mentioned above my stock goes back into the reusable pour and store bags – approx. 500ml in each. I’m storing my stock to make homemade vegetable gravy so this quantity is about right to thaw for one meal. 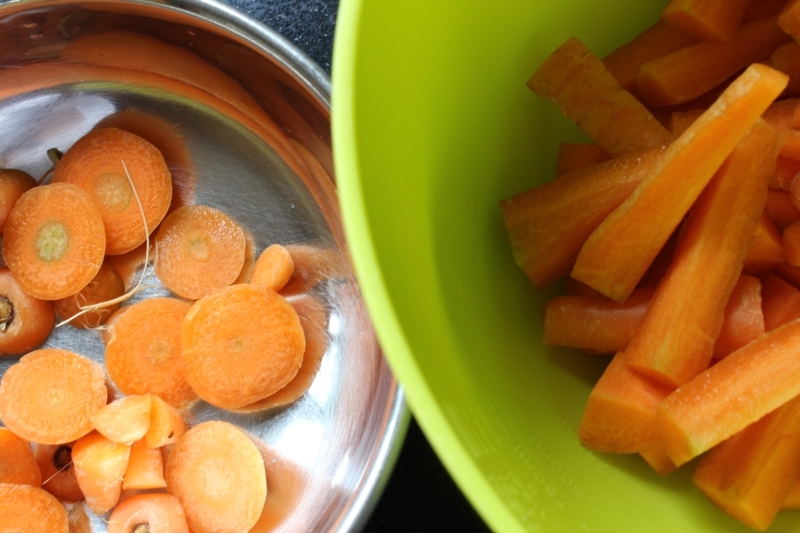 The scraps can now be added to your food waste recycling or compost – or you can have a go at what I’m experimenting with this Food Waste Friday! I’m wondering whether the life of the once-used vegetable scraps be extended further? When I carried out my No Waste Tastes Great routine earlier I came across a handful of mushrooms that had started to shrivel! They were then topped with mushrooms, a few more herbs, a little black pepper and boiling water! Here’s hoping it’s a good result – we shall see!